The Corps of Royal Electrical and Mechanical Engineers was formed on 1 October 1942. Although musical support was provided by a small group of musicians playing drums and fifes, the REME Band remained unrecognised by the military authorities until 1947. Today the band's expertise is seen and heard all over the world and it enjoys an outstanding reputation for musical excellence. In past years the Band has toured extensively in the USA, Canada, Germany, Bosnia, Italy, Cyprus, Uzbekistan, Guatemala, Mexico and throughout the whole of the United Kingdom. The Band was formed in 1957 by former pipers of the Queen's Own Cameron Highlanders and thus it wears the Cameron of Erracht tartan. 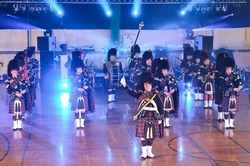 The band has an extensive repertoire of Scottish music including Slow Airs, Marches, Strathspeys and Reels. The band regularly performs across Berkshire taking part in carnivals and parades including the annual Remembrance Parade in Bracknell. Click here to view a video of their display at The Tattoo in 2010. The origins of a concert band within the Royal Army Medical Corps stem from its foundation in 1898. In 1938, the unofficial RAMC Band was taken over by the Army Council and became publicly funded after many years of subscription from the officers of the Corps. The band was upgraded in status to a minor staff band in 1947 and continued to serve the Corps until its disbandment in April 1984 after 46 years' service. A persevering decision was made to form the Army Medical Services Territorial Army Band out of the ashes of the RAMC Staff Band. It was to be based at the Duke of York's Headquarters in Chelsea as part of 257 (Southern) General Hospital. Recruiting musicians for the new band began in June 1984, and the necessary volunteers were found through local contacts and some ex-members of the Staff Band. After two years of hard work raising the Band from scratch and developing standards, authority was given for an official establishment from the 1st April 1986. At its first Kneller Hall Inspection in May 1991 the Band was awarded the grading of 'Very Good'. 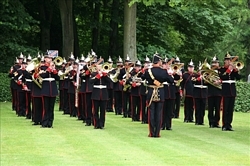 The band relocated to the Former Army Staff College in Sandhurst in October 2002. Current members' professions include Police Officers, teachers, company directors, and civil servants to name but a few. The REME Big Band is made up of members of the Band of the Royal Electrical and Mechanical Engineers and is one of the most versatile groups in the Band. The repertoire of the REME Big Band is exceptionally varied, playing Glenn Miller classics like In the Mood and American Patrol, to more contemporary modern big band music by composers such as Gordon Goodwin. Emer McParland will join the REME Big Band at The Tattoo. Emer is an exceptionally talented and versatile singer. Her experience spans many musical genres and she has worked with the likes of classical stars such as Lesley Garrett and Russell Watson. Her versatility has led her to sing on many movie soundtracks including the classic Tim Burton movie 'Sleepy Hollow' as well as the blockbusters 'Gangs of New York' and 'Tomb Raider 2'. Emer was a guest soloist at the Hyde Park VE Day celebrations singing to an audience of over 125,000 people. Her West End experience includes 'Starlight Express' and 'Napoleon'. Emer regularly performs with well known Big Bands such as the RAF Squadronaires and the BBC Big Band. The Kangaroos Gymnastics and Trampoline Display Team was formed in 1981. The Kangaroos are now recognised as one of the leading Gymnastic Display teams in Europe, and one of the top indoor and outdoor arena acts of any kind in Britain. The Team has performed in front of Her Majesty The Queen, as part of the opening ceremony of London’s Broadgate Complex. They have performed at Wembley Stadium on two occasions and have appeared on both LWT’s ‘YOU BET!’ and BBC’s ‘BLUE PETER’. The Team regularly performs at large indoor and outdoor events including; The Shrewsbury Flower Show, The Birmingham International Tattoo and The Manchester Tattoo.